First mention of the lands of Fingask occur in the Foundation Charter of the Abbey of Scone in 1115 by Alexander I. St. Peters Well, in the dell below the Castle, has been a place of pilgrimage since the days that pilgrims would land at Port Allan on the Tay to walk to the shrine of St. Queen Margaret at Dunkeld. The oldest part of the Castle was built by Partick Bruce in 1594. The Threiplands first came to Fingask at the end of the 16th Century, when Partick Threipland married a Miss Bruce. The Bruces had lived at Fingask since at least the 14th Century. During the 18th Century Fingask was plundered and occupied by Government Dragoons. It was confiscated by the Crown as one of the forfeited estates as a result of the Threipland family’s support of the Jacobite cause. It was repurchased by Sir Stuart Threipland in 1783 and remained in the Threipland family until the early 1920’s when it was purchased by Brian Gilroy who was responsible for extensive renovations and restoration work. 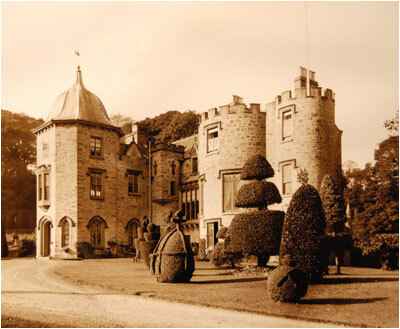 The Castle returned to Threipland ownership in 1968. Eminent visitors have included James VIII in 1716, Bonny Prince Charlie in 1745 and Sir Walter Scott. The Threipland’s unwise political choices and the oddities of life have meant that the Threipland family have bought Fingask four times in the last 400 years!